Brockley Road runs from the junction with Smith Street opposite the sports field southwards to join the A428 at the Cambourne interchange. 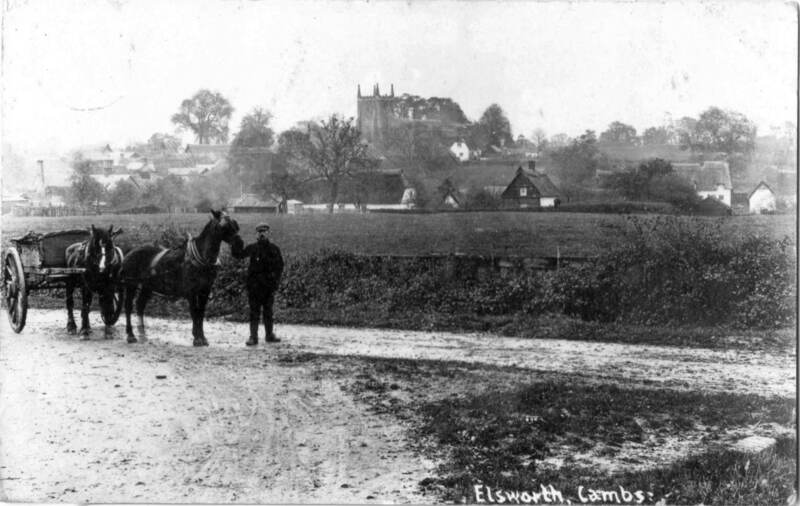 Before Cambourne was built the road led directly to what was then the A45 (now A428) close to Common Farm. 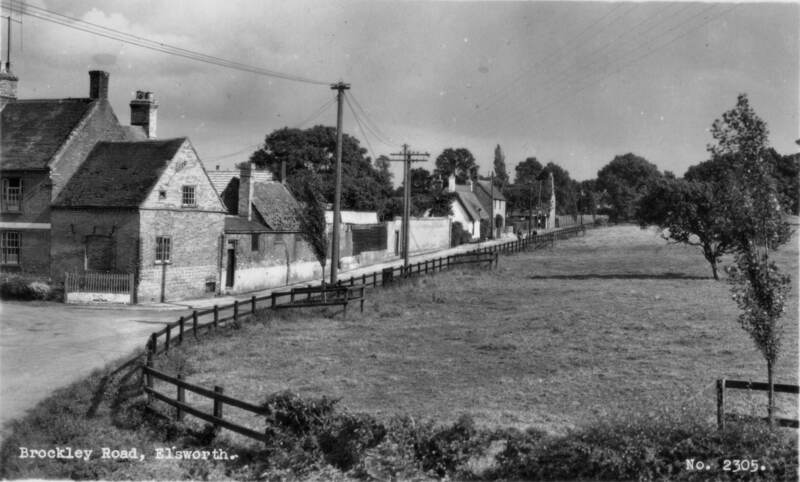 Earlier Brockley Road was just a field road leading to Common Farm and did not connect to the main road (formerly the A45, now the A428) between St Neots and Cambridge. The Poacher pub (formerly the Fox and Hounds) stands on the corner of Brockley Road and Smith Street and Empson's Garage (formerly Papworth's) is a few hundred yards up Brockley road from the Smith Street junction. The entrance to the Avenue Farm business park is also off Brockley Road just as it leaves the village. Cotterell's Lane runs from Brockley Road just past the Poacher to Brook Street, parallel to Smith Street. Maps of the village past (1881) to the present day call it Cottrell's Lane rather than Cotterell's Lane; it is not clear when or why the extra 'e' was added to the street signs. Spigot Lane runs from Brockley Road to Brook Street but is only accessible for vehicles as far as Daisy Cottage and number 8 after which it narrows to a footpath. The Fox and Hounds pub on the corner of Smith Street and Brockley Road in the early 20th century. The upper floor window had been replaced by two larger windows by the 1970s. 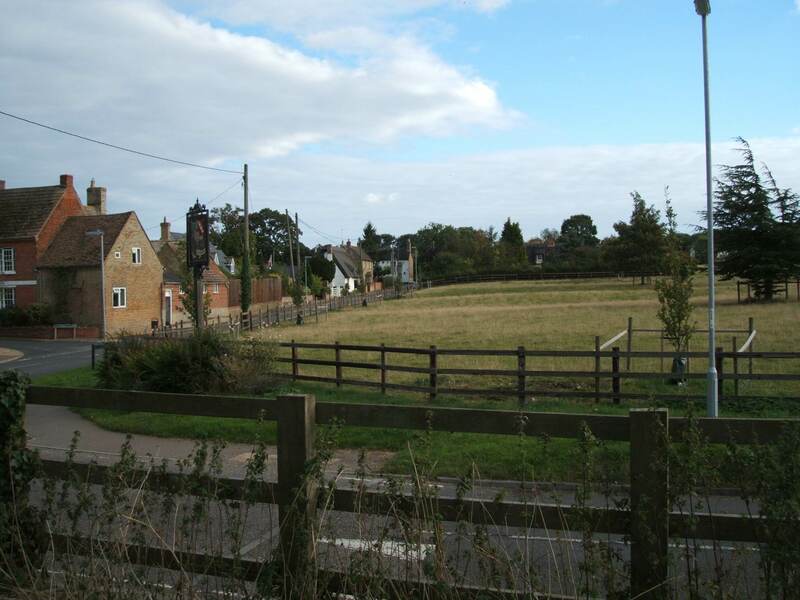 View across Tom's field from Brockley Road by the start of the bridleway showing cottages along Brook Street and the church in the distance. 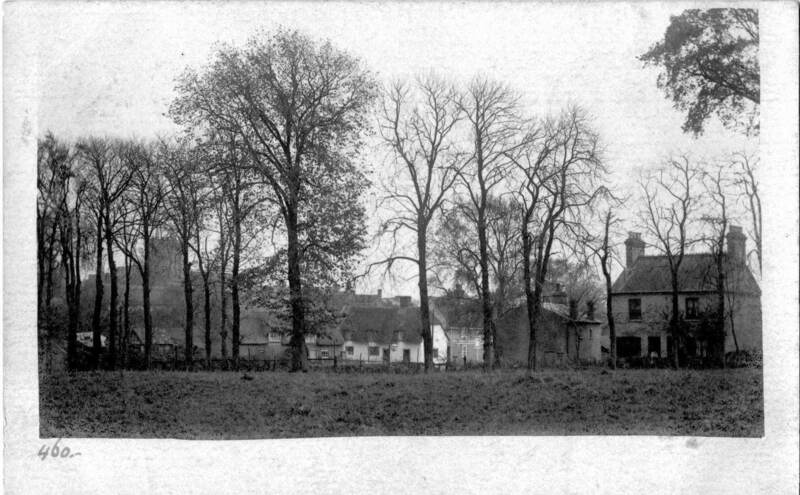 View across Tom's field towards Brook Street around 1924. 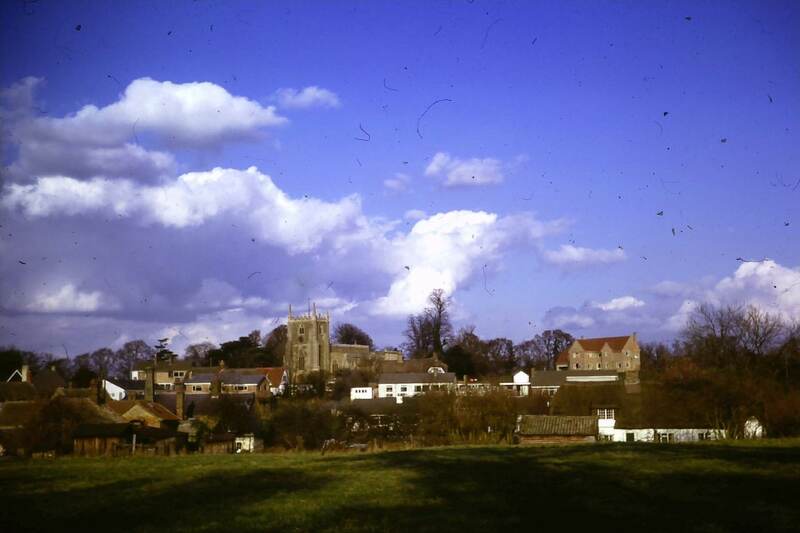 A number of cottages along Brook Street and Church Lane that have since vanished can be seen in this picture. 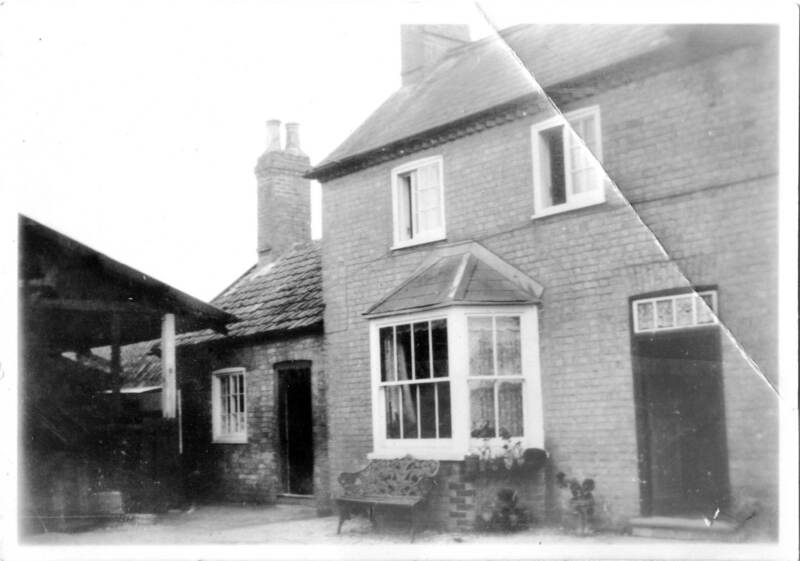 View of the Fox and Hounds pub around 1937. 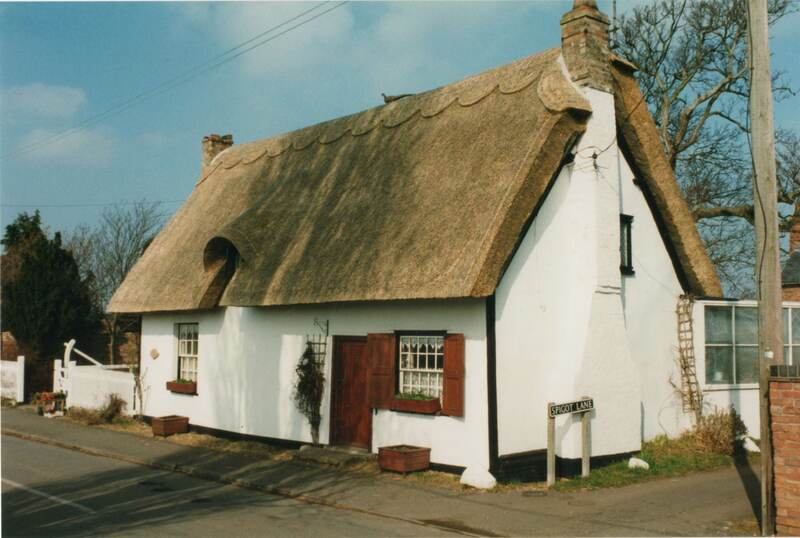 By this time the thatch roof had been replaced with corrugated iron, a feature that was common in the village into the 1960s. 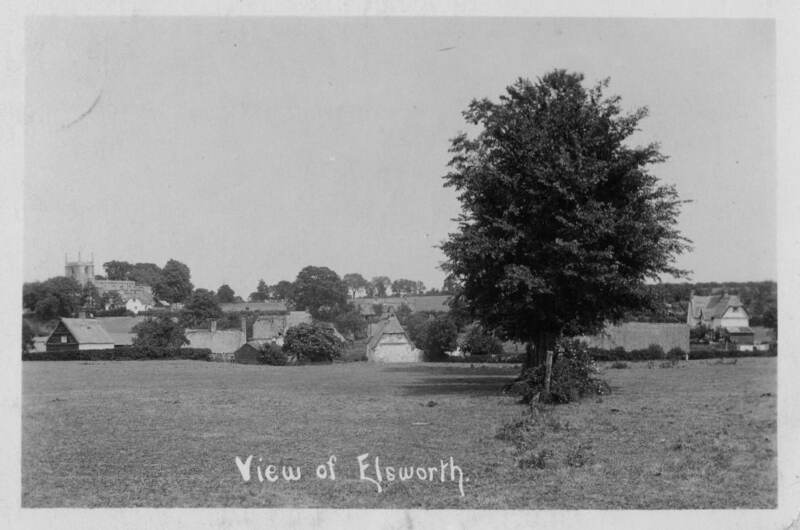 The original allotments can be seen opposite the pub. 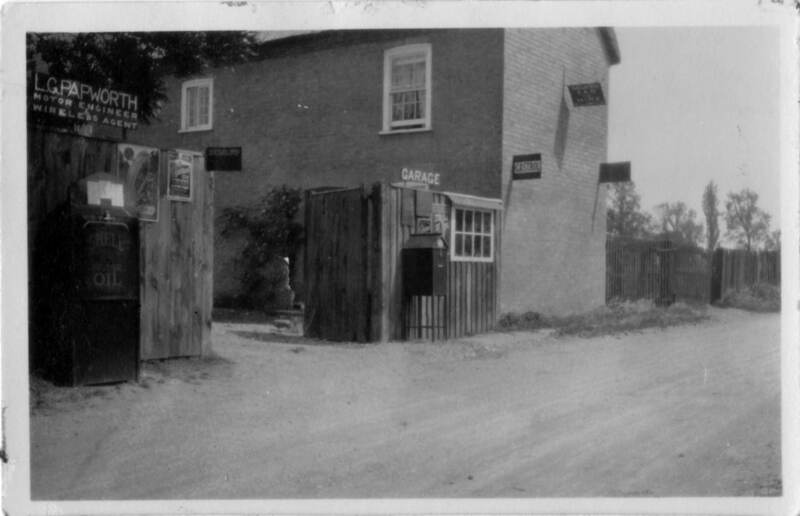 A view of the Fox and Hounds pub in the early 20th century when the roads were unpaved. Opposite the pub are the original village allotments. 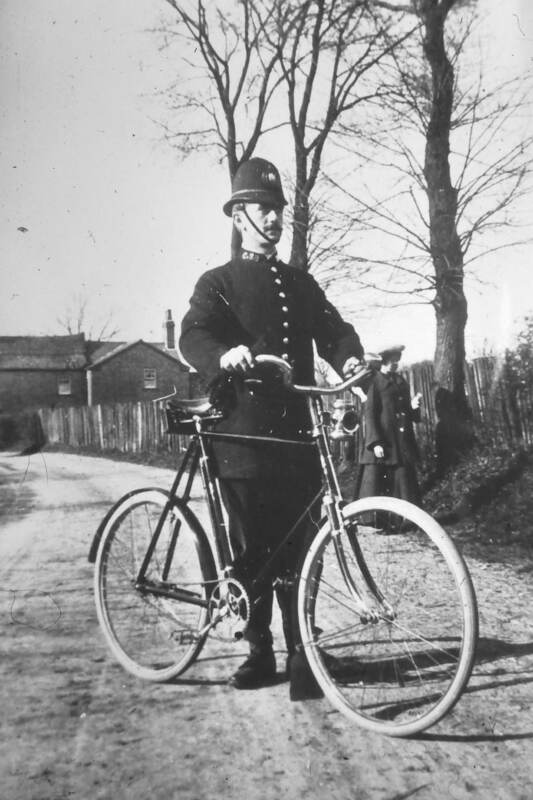 Village policeman with bicycle in Brockley Road in the early 20th century. The village garage can be seen in the background. The bicycle is equipped with an acetylene lamp. Brockley Road in winter, probably early 1960s from the garage showing the wooden fence beside the field. 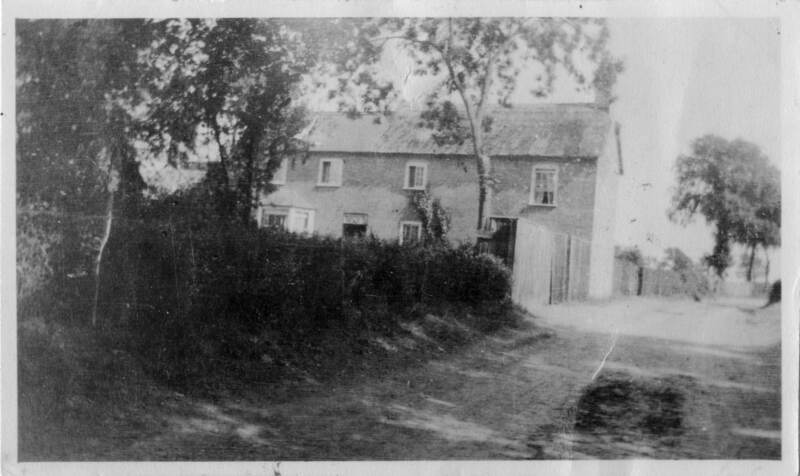 The cottage on the left belonged to the Tabraham family and has since been demolished and replaced. 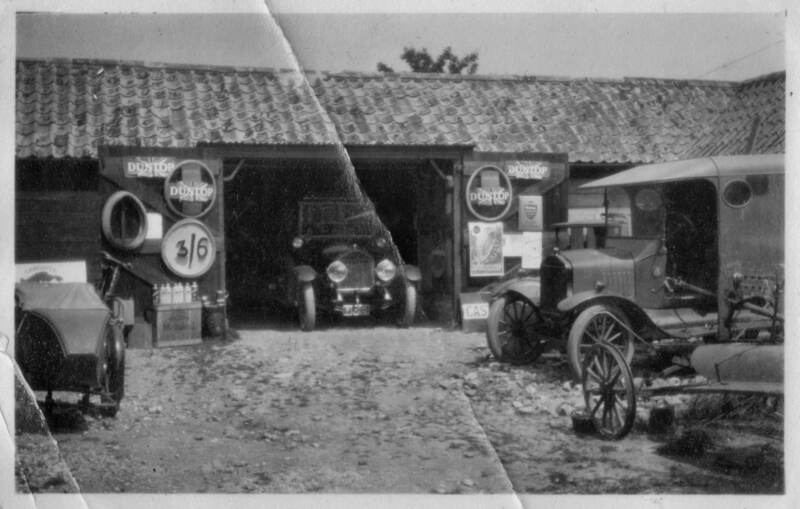 This picture shows the garage on Brockley Road as it was before the arrival of petrol pumps in the later 1920s. The road is unpaved and there is no pavement. The section of wooden fence by the garage can be seen. 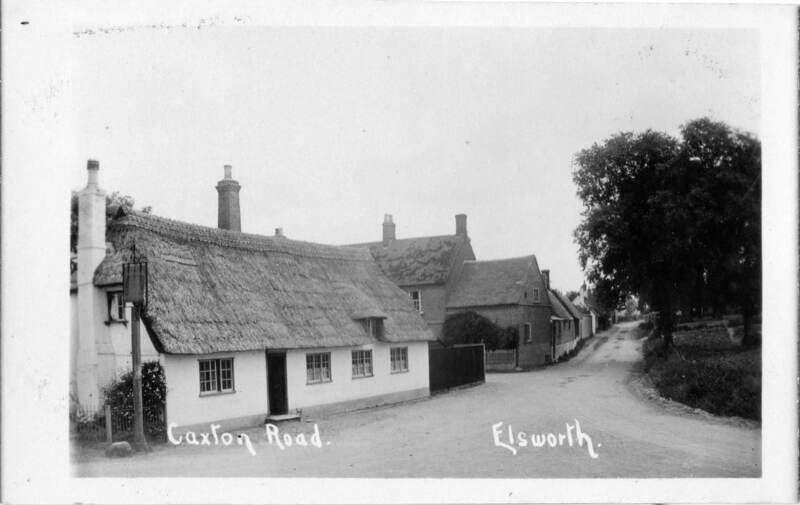 This may be before Leslie Papworth set up a garage there as no signs are visible. 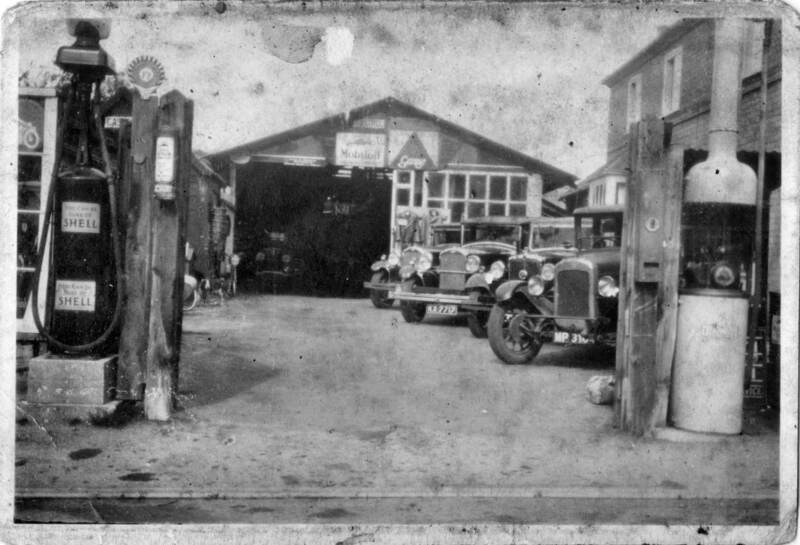 The garage in Brockley Road in the early 1920s. 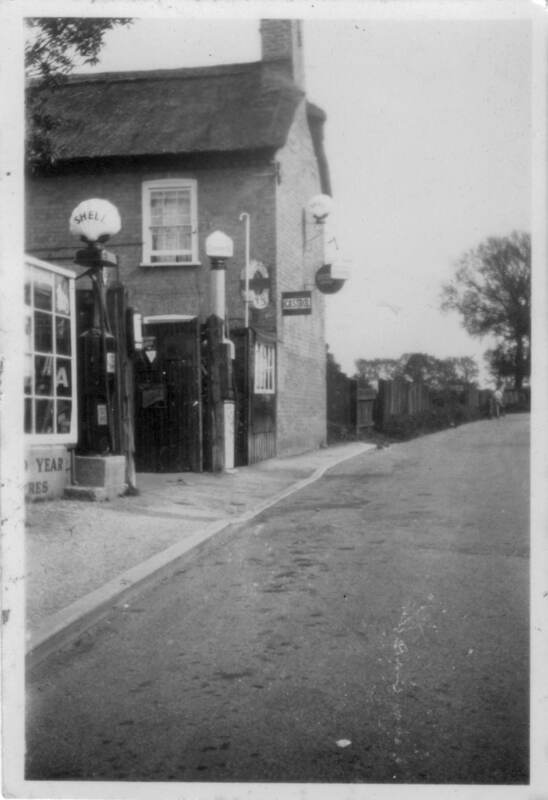 The sign says "L G Papworth Motor Engineer" and Shell and Castrol signs are visible but no petrol pumps at this time. 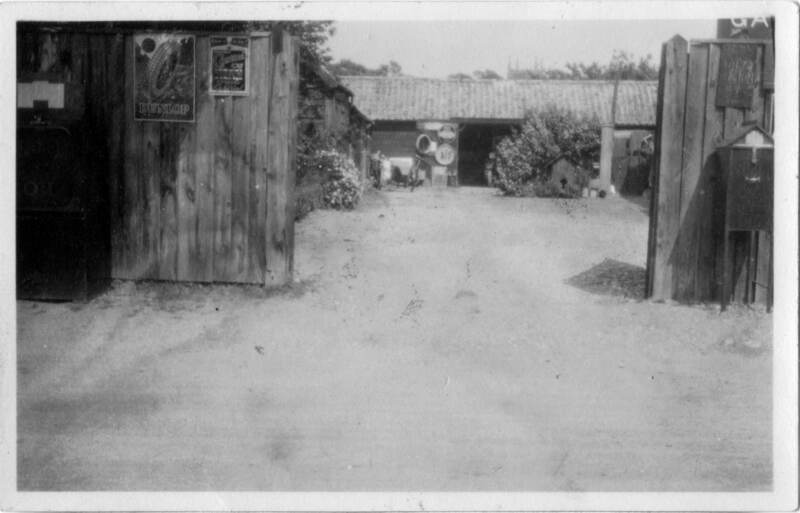 Looking in the yard of the garage in the early 1920s. 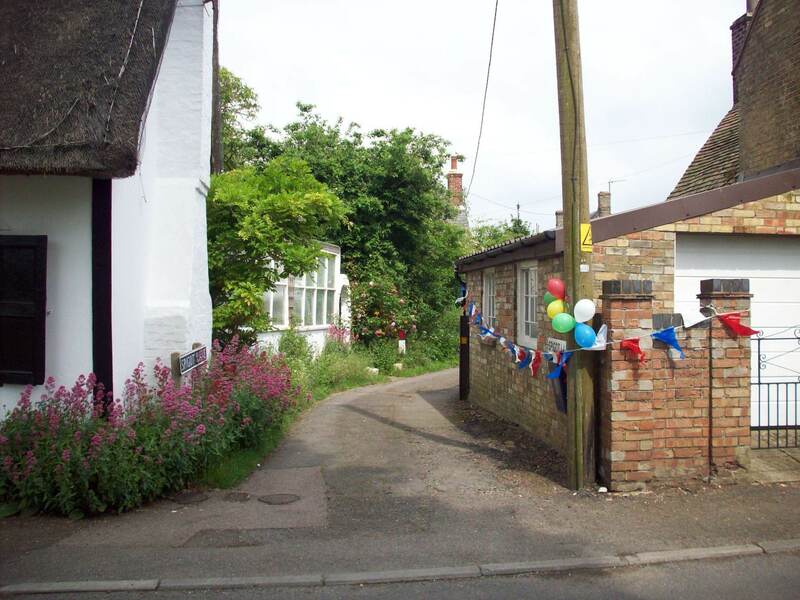 It seems very run down, with one car just visible in the workshop behind the large bush and dog kennel. 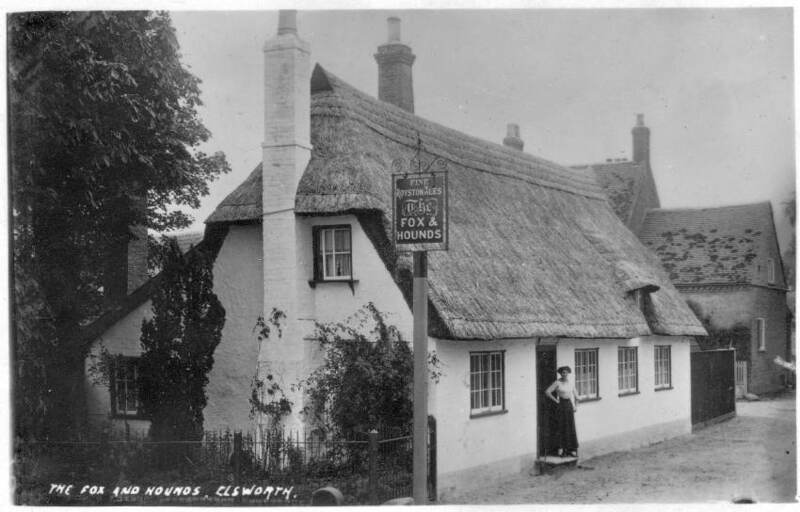 It may have been a smithy previously as there were a number of such businesses in the village in the 19th and early 20th century. 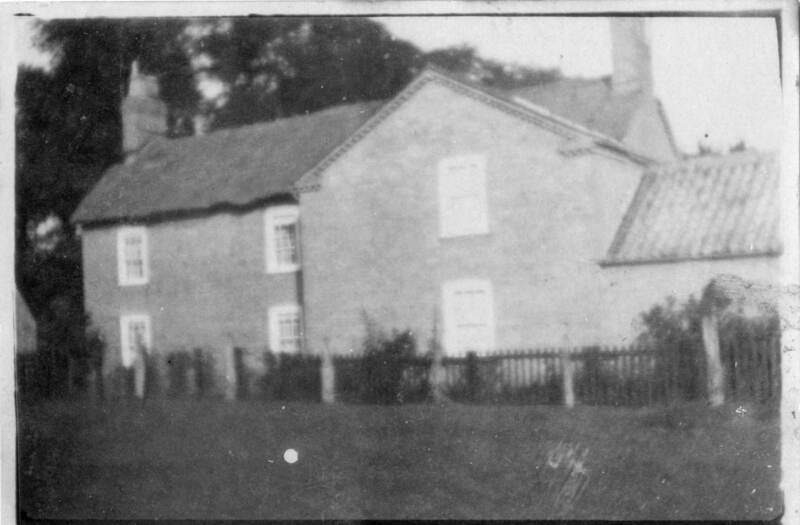 The house belonging to the garage seen from Tom's field. This is probably in the 1920s or 1930s as there is no sign of power cables. The house belonging to the garage from inside the yard. The time may be late 1930s or the 1940s as a wire can be seen which might be a power or telephone cable. The garage with petrol pumps and electricity supply visible. The road is paved but the footpath from the garage to the council houses built further up has not been built yet. Daisy Papworth crossing the garage yard carrying a petrol can, probably in the 1950s. 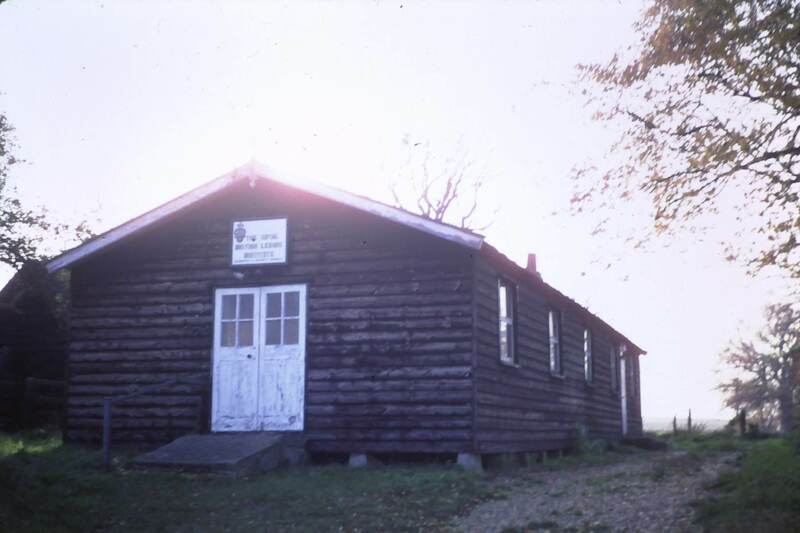 The workshop is still recognisable today. The cars (front to back) are Morris Oxford, Austin and two Humbers). The garage yard, possibly in the 1940s. 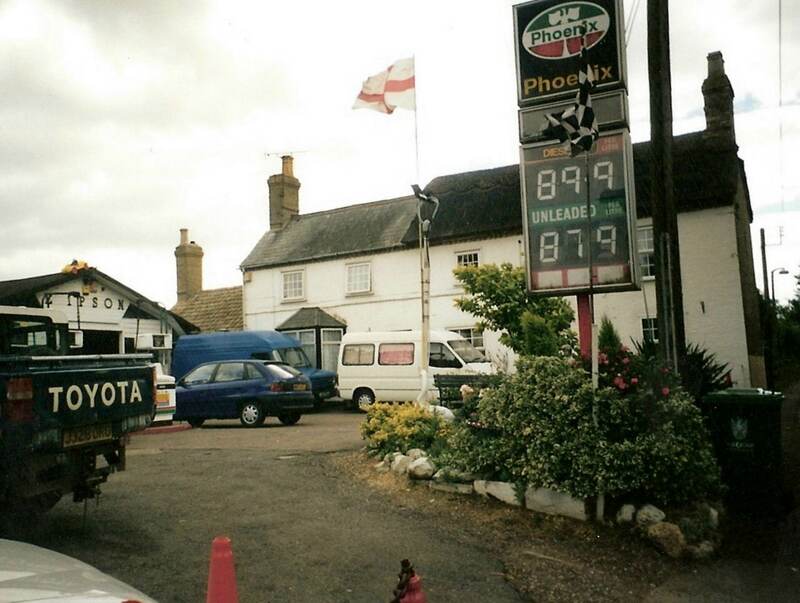 There may be electricity and the road has been paved but the old petrol pumps are still there. The cars (front to back) are an Austin, a Morris and two Humbers. 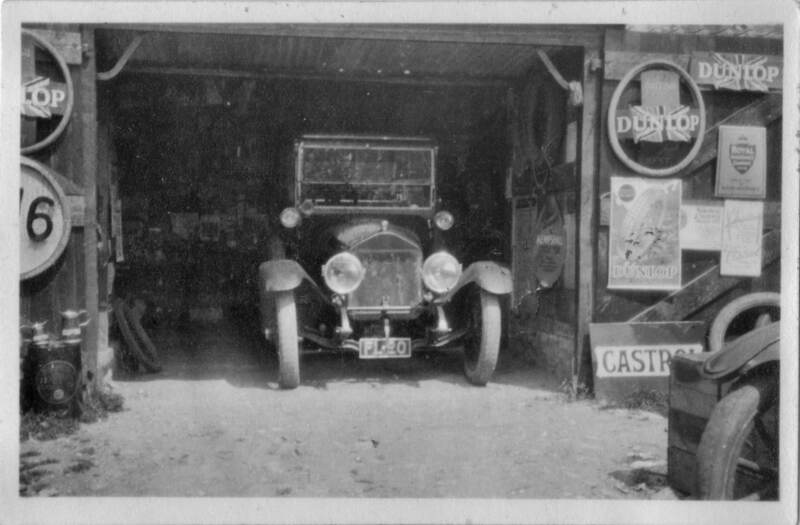 Car in the garage workshop, probably in the 1920s as this is not the later workshop in other pictures. 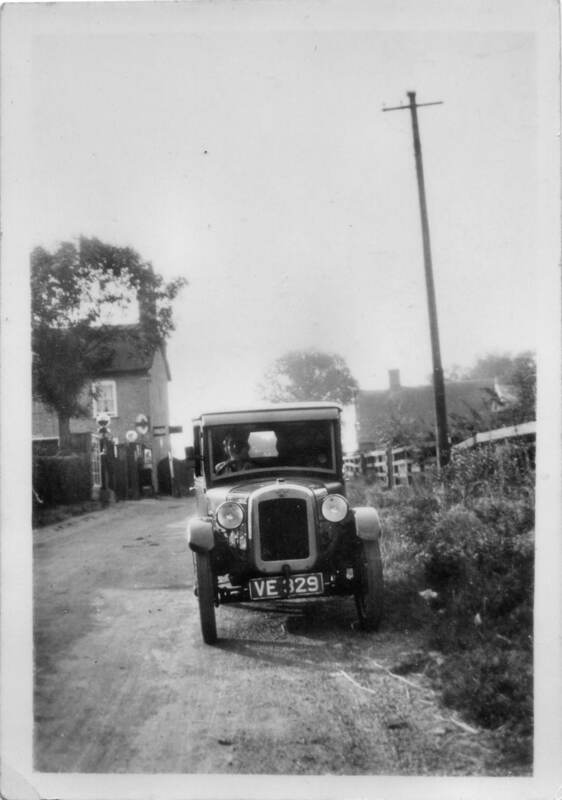 A car in Brockley Road, possibly in the 1930s. There is a telephone cable visibly but no electricity. The road is not paved at this time. The car is an Austin 7. The garage yard with a car in the workshop. The workshop has not been rebuilt at this point so it may be late 1920s or early 1930s. 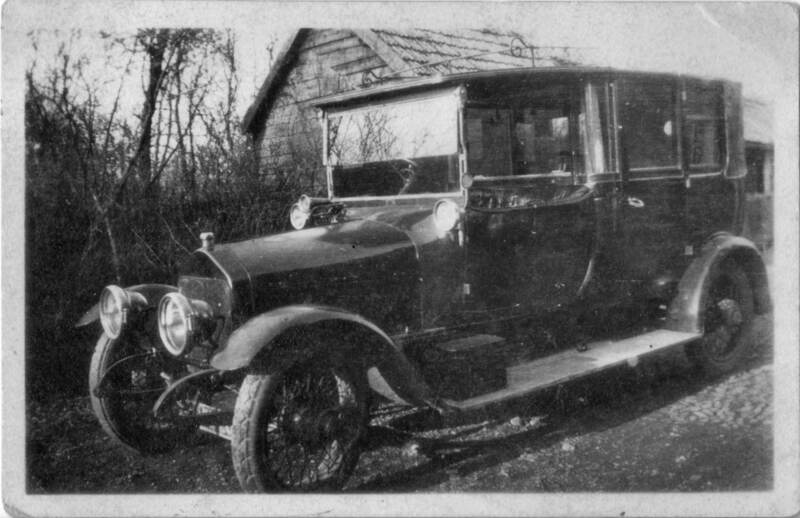 One of the very first cars in Elsworth, taken in 1928 or 1929. The car belonged to Leslie Papworth. The location is not clear but probably near the garage. 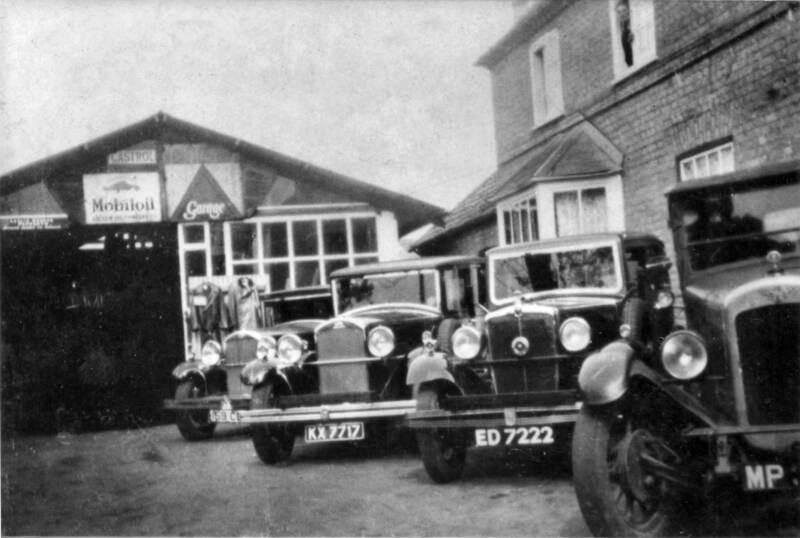 Cars lined up in Papworth's garage probably in the 1930s. The workshop is similar today. The cars (front to back) are an Austin, a Morris and two Humbers. 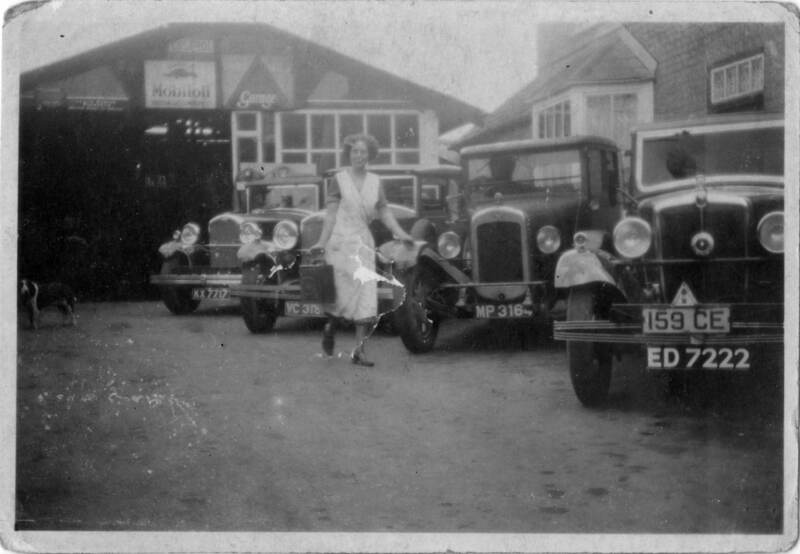 Mechanics at Elsworth Garage between 1944 and 1952. The people are (l-r) Ken Rolt, Bernard Woolf and Geoff Meeks. The car is a 1936 Austin 10 Deluxe. 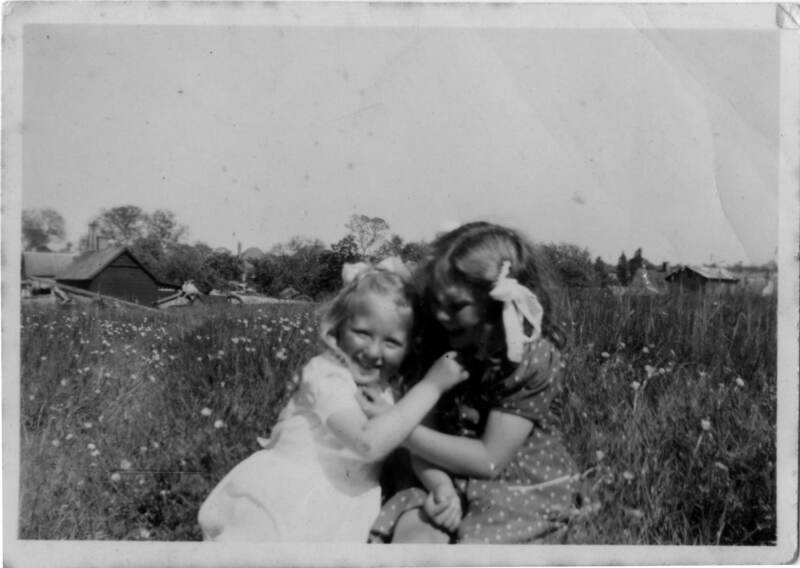 Ann Papworth and Daphne Tabraham in Tom's field, 1940s. 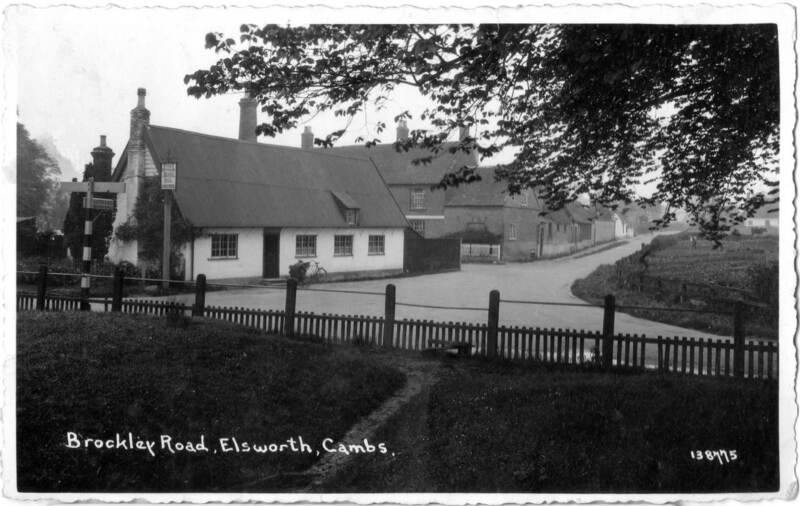 In the backgound old horse drawn carts can be seen and the roofs of two bungalows in Church Lane, both since demolished. Brockley Road looking north from the garage probably in the late 1940s. 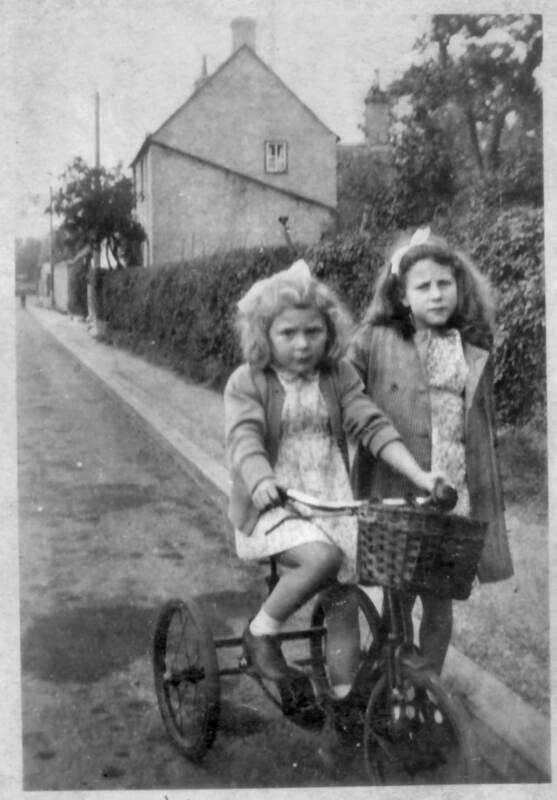 Ann Papworth and Dorothy (possibly related to Tabrahams) on Brockley Road in the late 1940s. 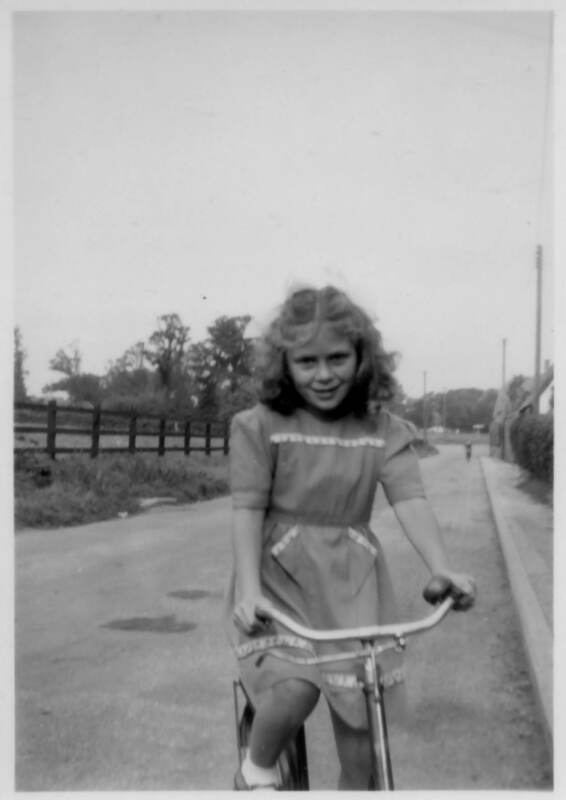 Ann Papworth in Brockley Road, probably now in the early 1950s. The road is still empty of traffic unlike the present day. A view southwards along Brockley Road from Smith Street, probably in the late 1950s or early 1960s before the petrol pumps were moved away from the roadside. A VHF television aerial can be seen on Brockley Farm. The view southwards along Brockley Road from Smith Street in 2016. Most of the buildings in the previous picture are still present but a new house has been built where part of a farmyard met the road. This picture shows the eastern end of Cotterell's Lane where it joins Brook Street. It was taken from the paddock that used to lie between Smith Street and Cotterell's Lane. This picture dates from around 1905. 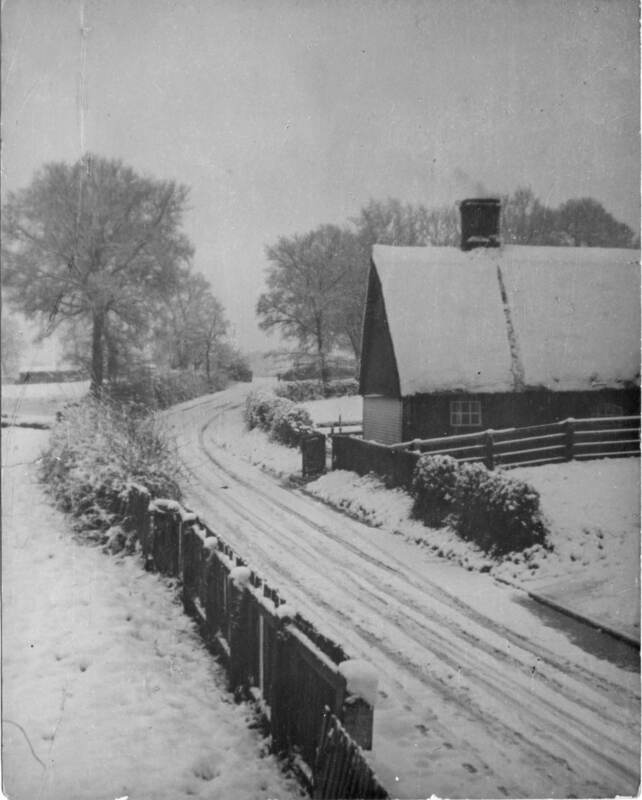 This picture shows the row of cottages at the western end of Spigot Lane. 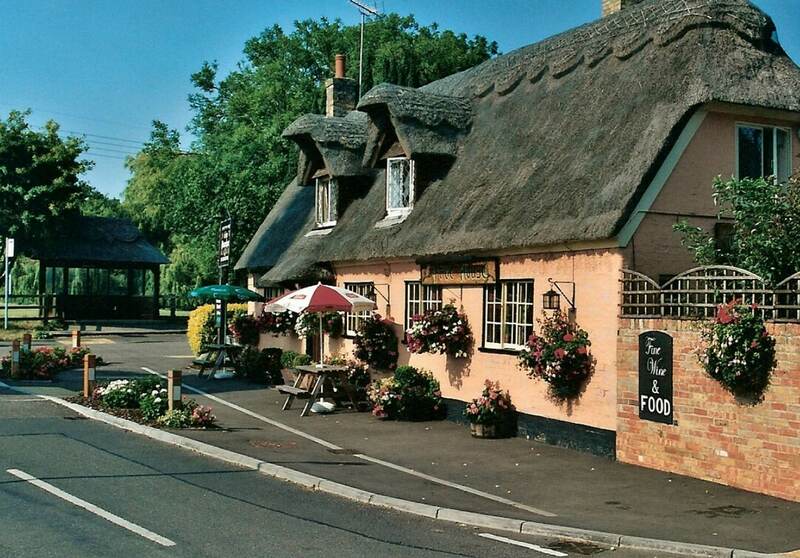 Today they are numbers 8 and 10 and the right hand cottage has been greatly modified. There are no electricity cables visible suggesting this picture is likely in the 1930s or early 1940s. 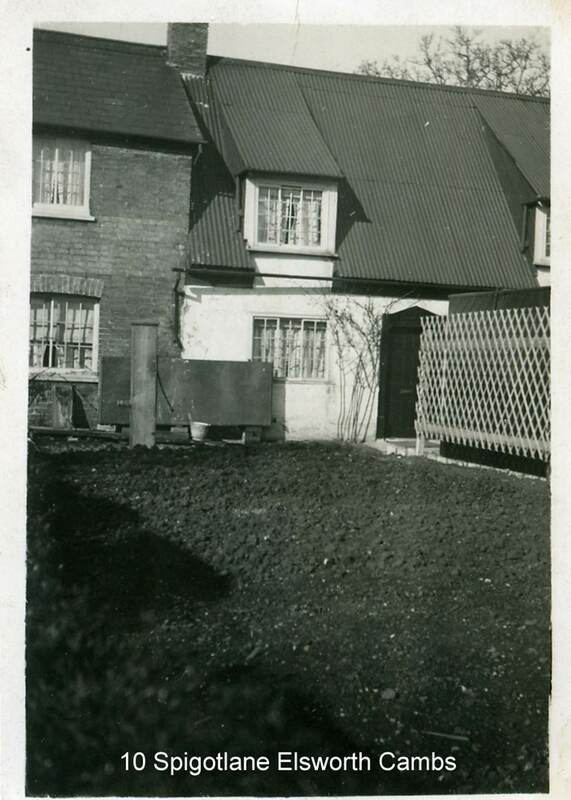 This picture shows the western end of Cotterell's Lane in 1928 with Brockley Farm. 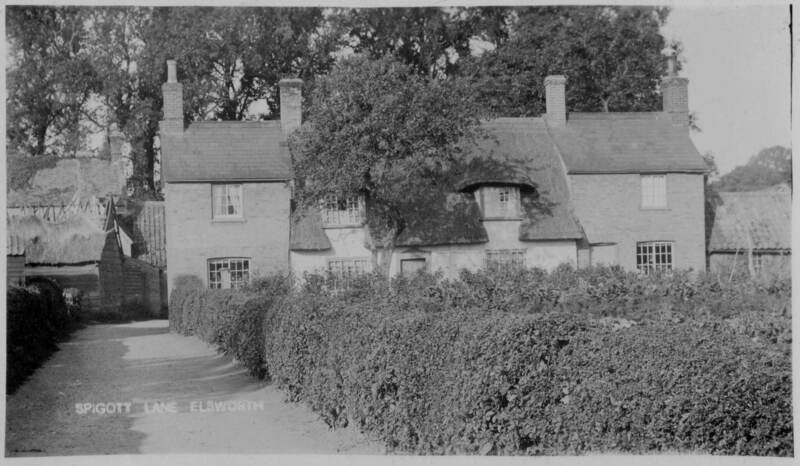 The original picture suggested that Brockley Farm was once called Lordship Farm (see Broad End) and the lane was called Calcutt's Lane. 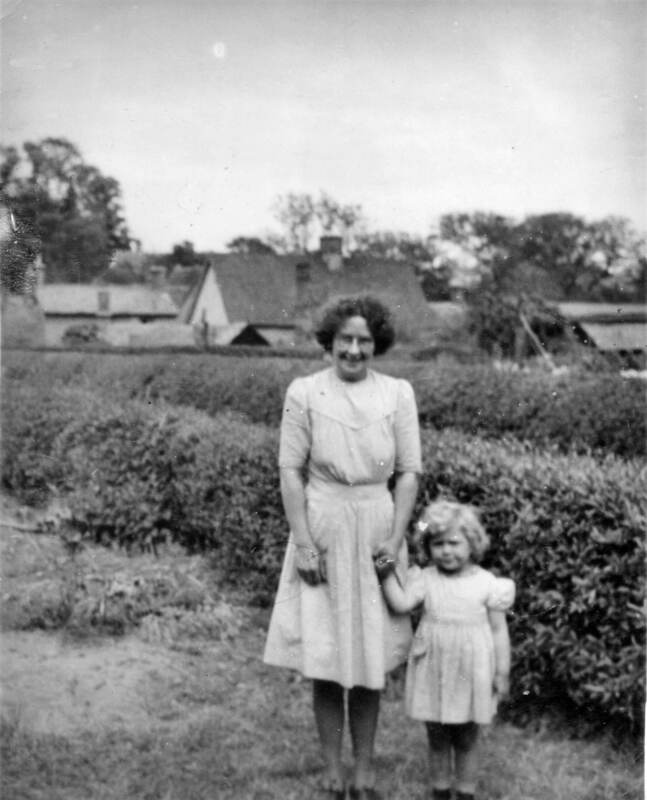 Daisy Papworth with Ann in the garden of Daisy Cottage in Spigot Lane. The houses in Brook Street can be seen in the background. 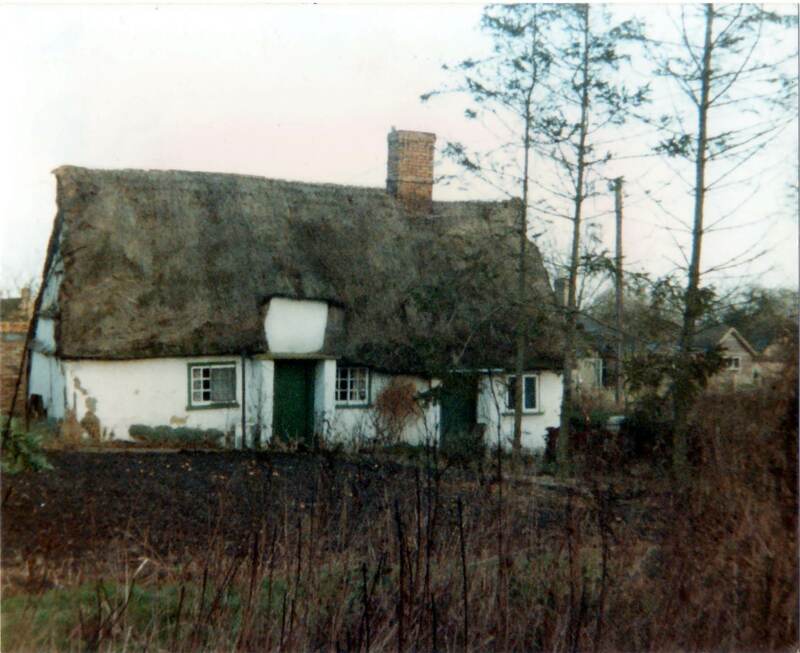 Daisy Cottage in Spigot Lane, probably in the 1960s before the extension was built on the front. The unusual front door is visible along with the old pump at the front and a tank, possibly for rainwater. 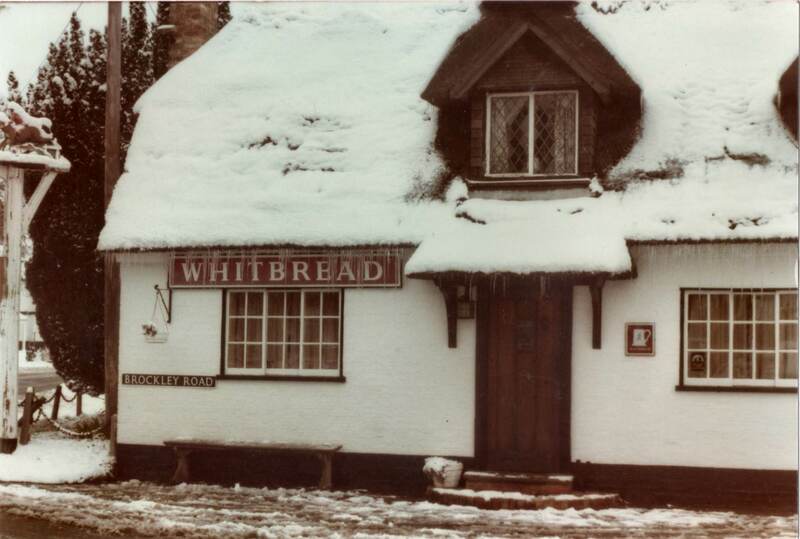 The Fox and Hounds pub (now the Poacher) in winter in the 1970s. 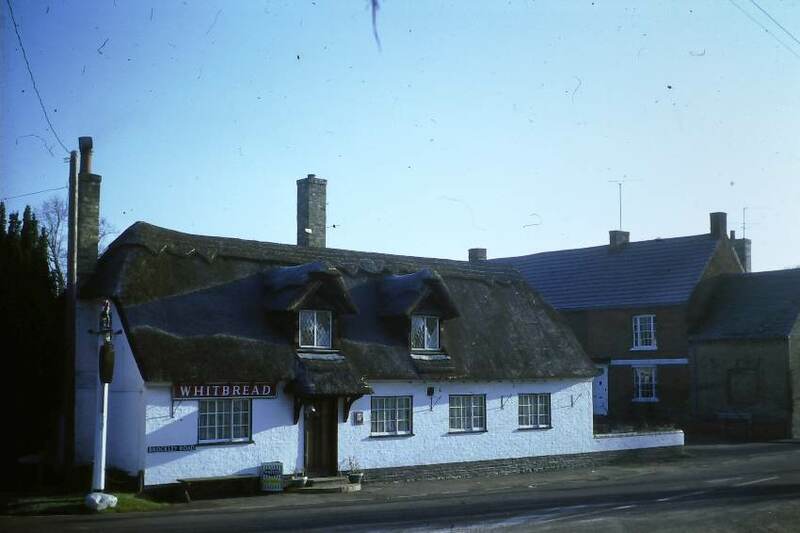 Fox and Hounds pub (now The Poacher) seen from Smith Street 1979-1981. The Poacher seen from the field opposite in January of 1986. 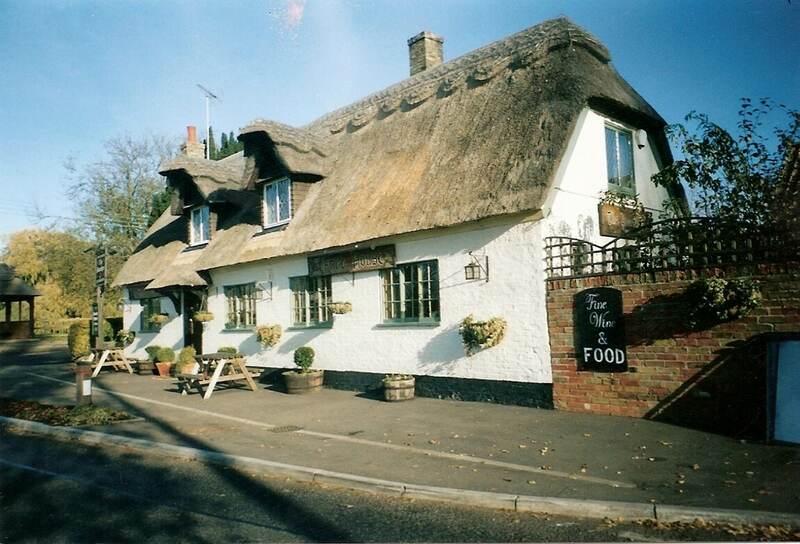 The Poacher in 2005 with the pavement in front increased as part of the relayout of the road junction. The Poacher around 2007 painted in a rather non traditional colour. 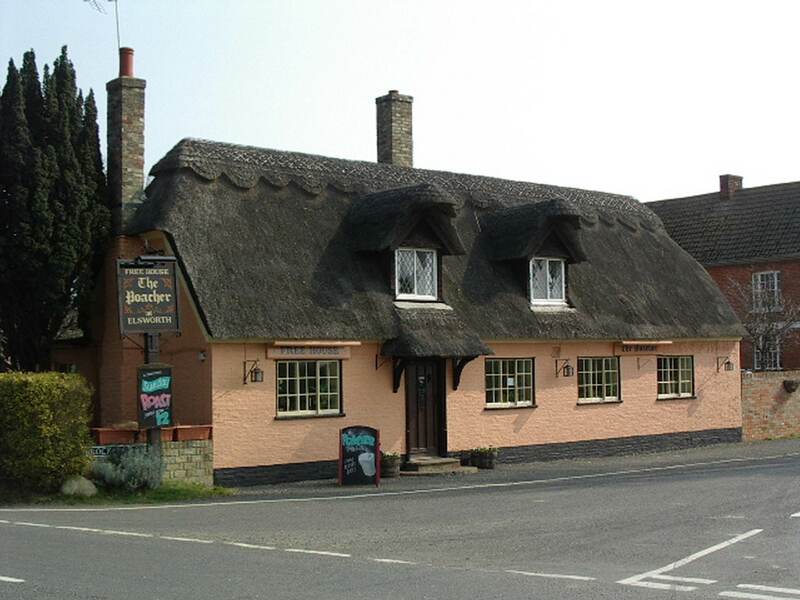 The Poacher in summer 2007 with the pink paint. 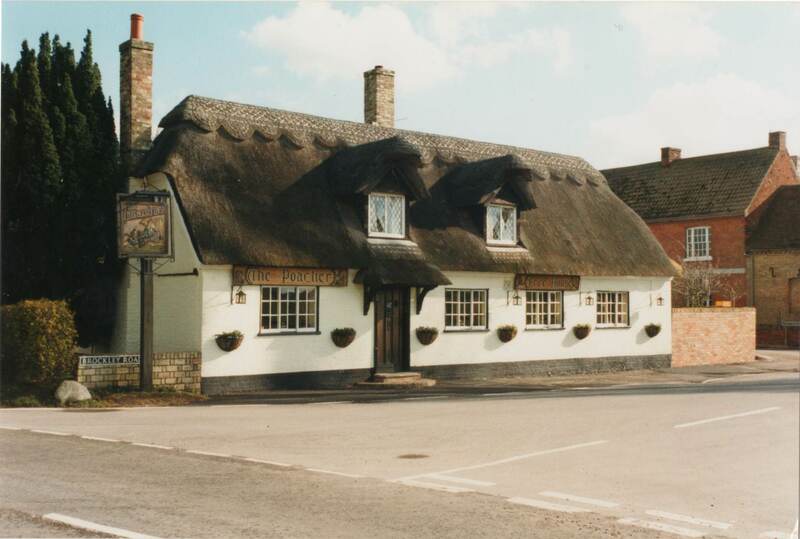 The Poacher in the 1990s with new signs. 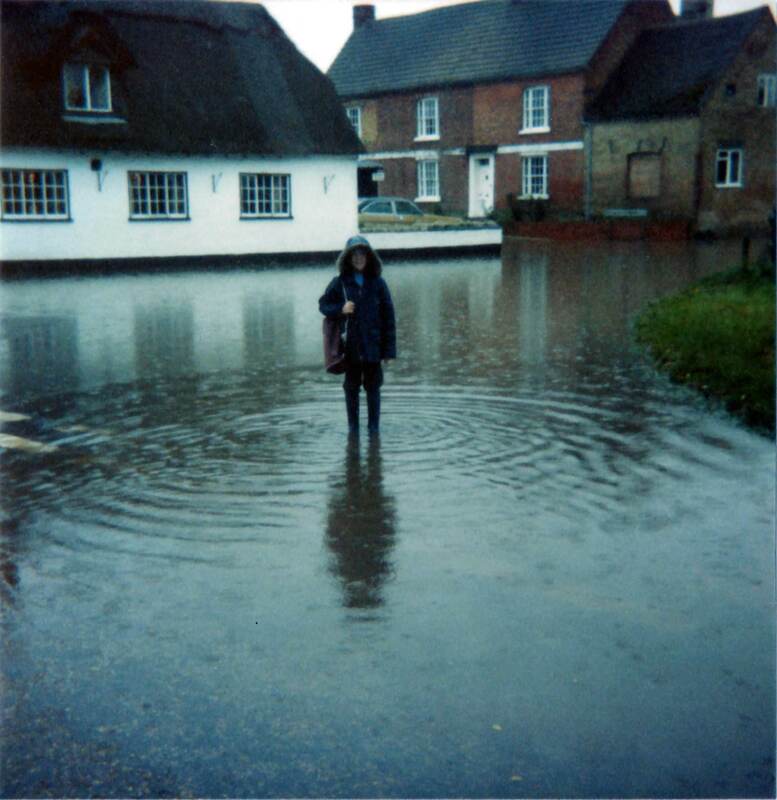 Flooding outside the Fox and Hounds (now the Poacher) in 1987. Brockley Farm on the corner of Cotterell's Lane and Brockley Road in the 1990s. 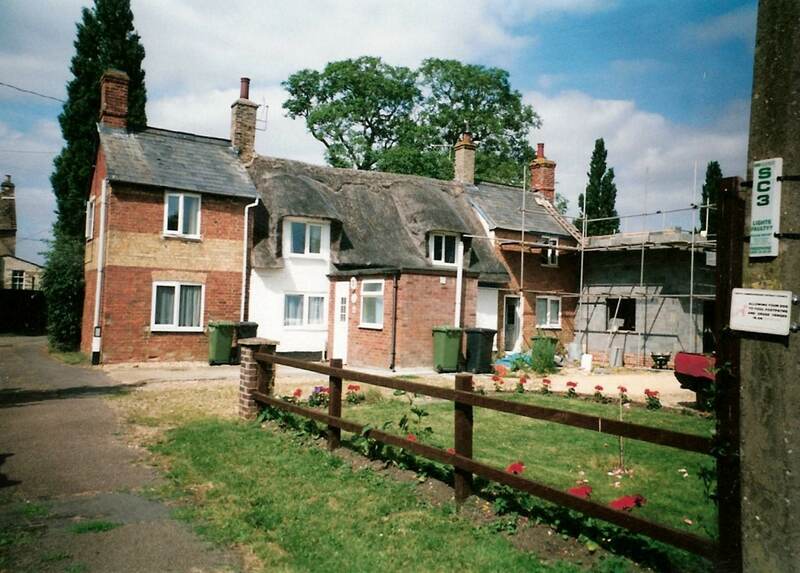 The farmyard has been redeveloped for housing. 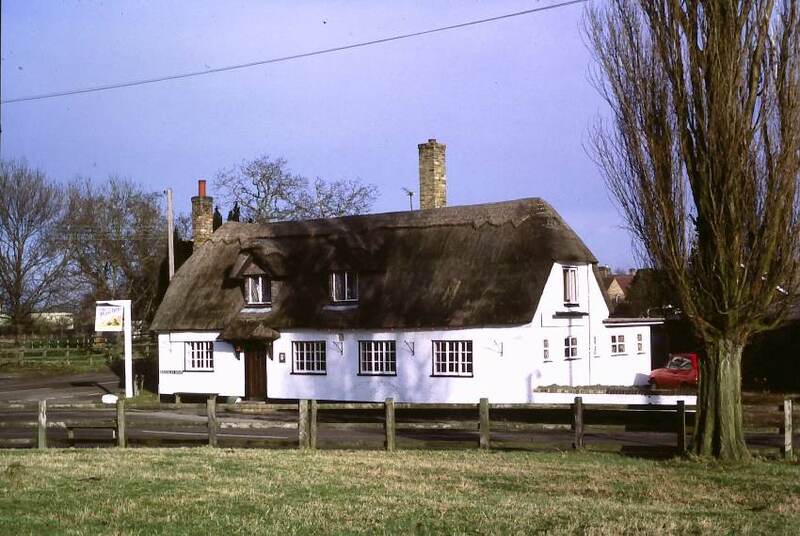 Thatched Cottage on Brockley Road on the corner of Spigot Lane, 1990s. 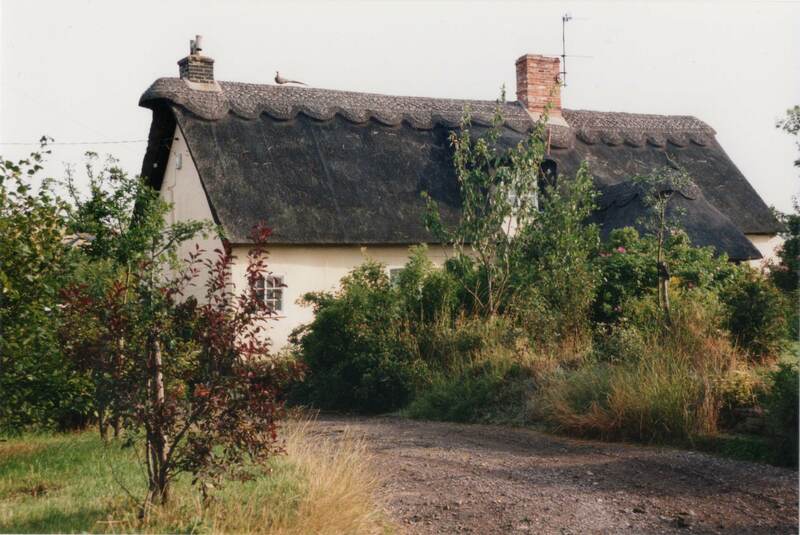 Thatched Cottage on Brockley Road in summer, 1990s. The western end of Spigot Lane seen from Brockley Road in the 2007 celebrating a birthday. 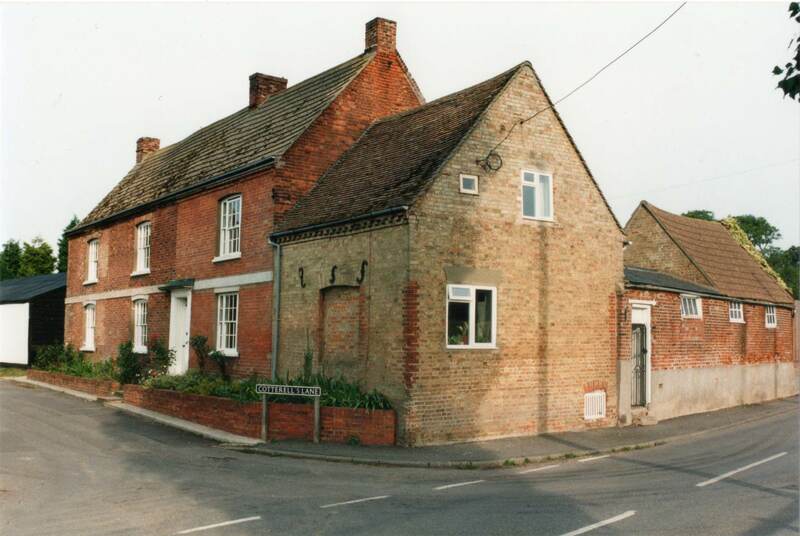 The extension to the rear of the cottage on the left has since been demolished and replaced in the 21st century. Early brick built cottage called The Elders with peg tile roof in Brockley Road. The garage in Brockley Road in 2006. It has changed a lot since the 1930s but there are still lots of cars and the house is much the same. 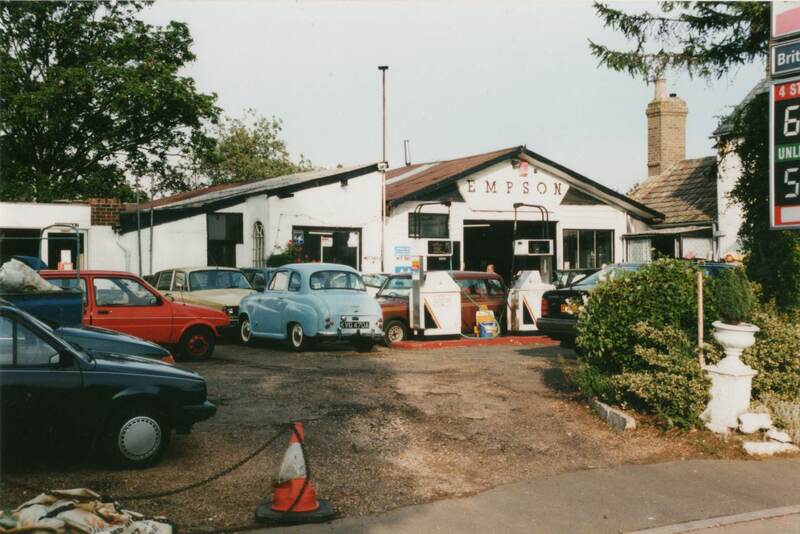 Empson's garage forecourth in the 1990s. Empsons garage seen from the south. Note the fuel prices! 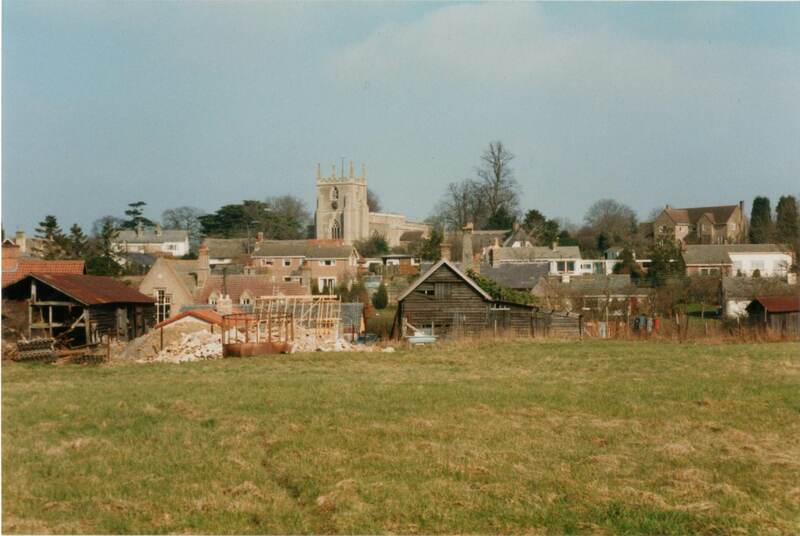 The view across Tom's field in the 1990s when the old carpentry workshop was being converted into a dwelling. 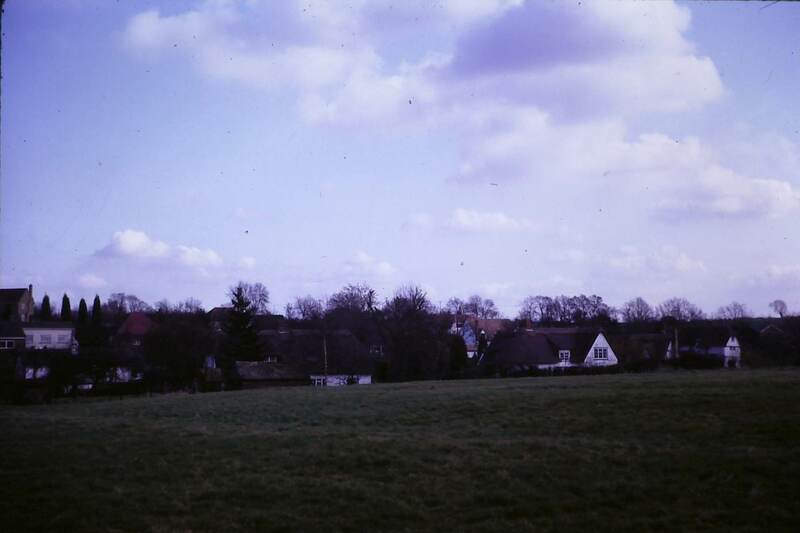 View across Tom's field from Brockley Road in the 1970s showing some of the changes in Brook Street, Church Lane and the Causeway. The view across Tom's field from Brockley Road in the late 1980s. 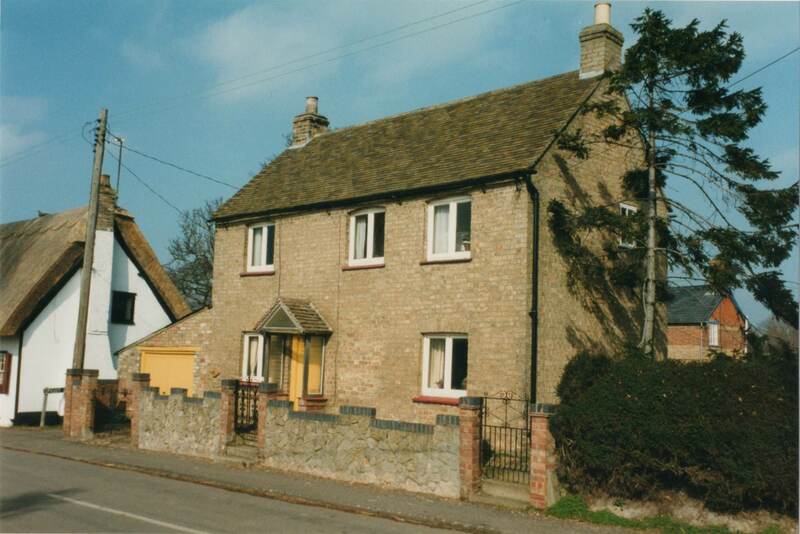 Many of the cottages have been updated and extended, and new houses built. 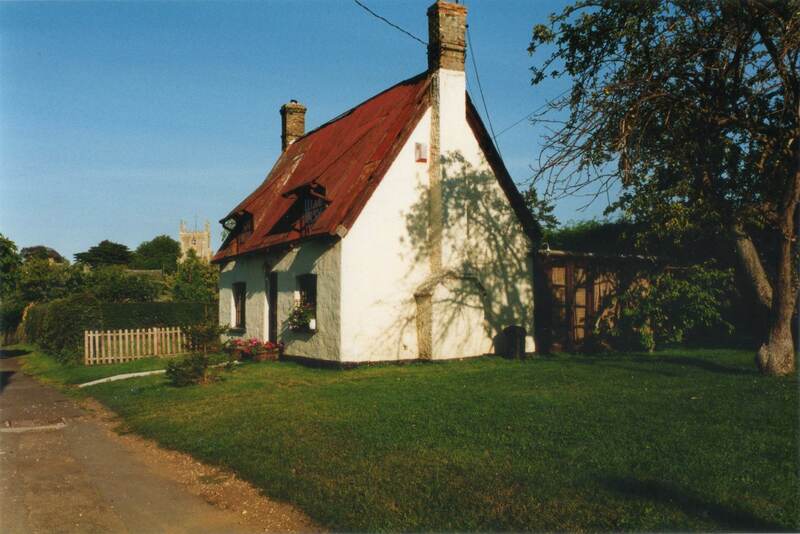 A bungalow in Church Lane with a distinctive red roof has since been demolished and replaced with a new bungalow. 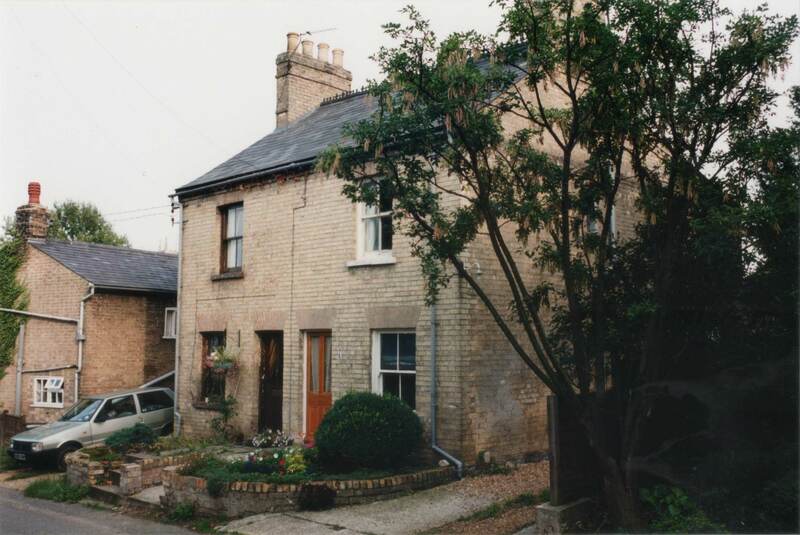 Brock Cottage in cottage in Brockley Road as seen in the 1990s. It is largely unchanged today. British Legion hut in Brockley Road in 1981. 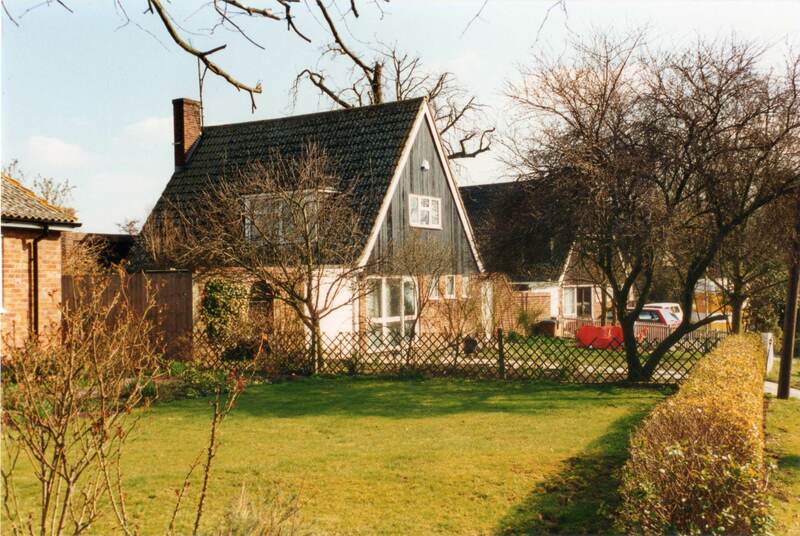 This was demolished in the early 1990s and a bungalow built on the site. This cottage in Brockley Road belonged to the Tabraham family. 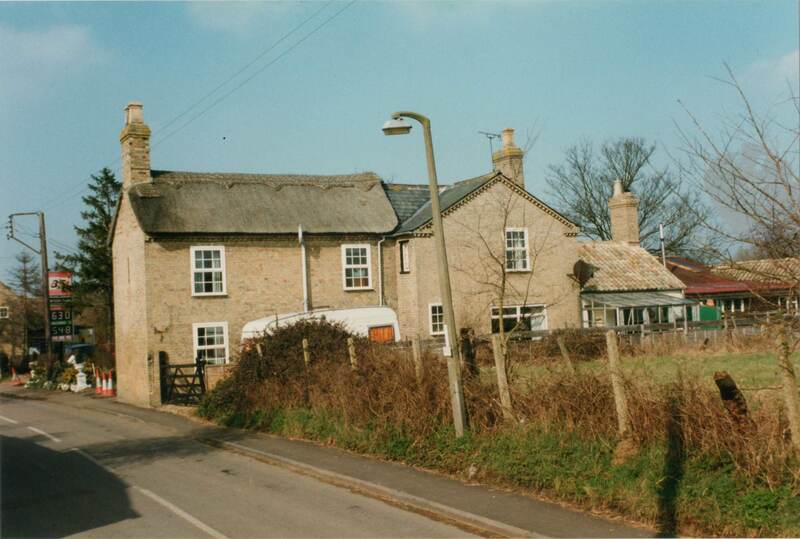 The photo was taken in1989 since when it has been demolished apart from the chimney and replaced with a new much larger cottage. 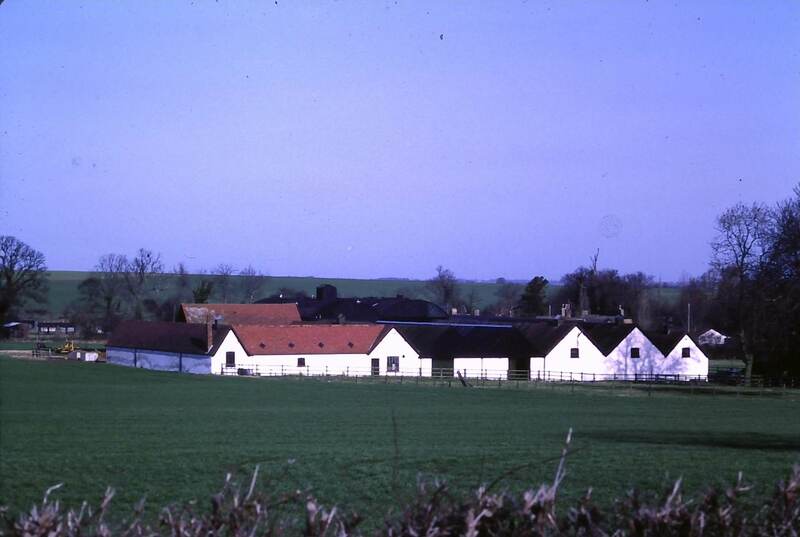 View of Avenue Farm in the 1980s from Brockley Road showing the original farm buildings and farmhouse. The black roofed building housed the grain silos and grain dryer. 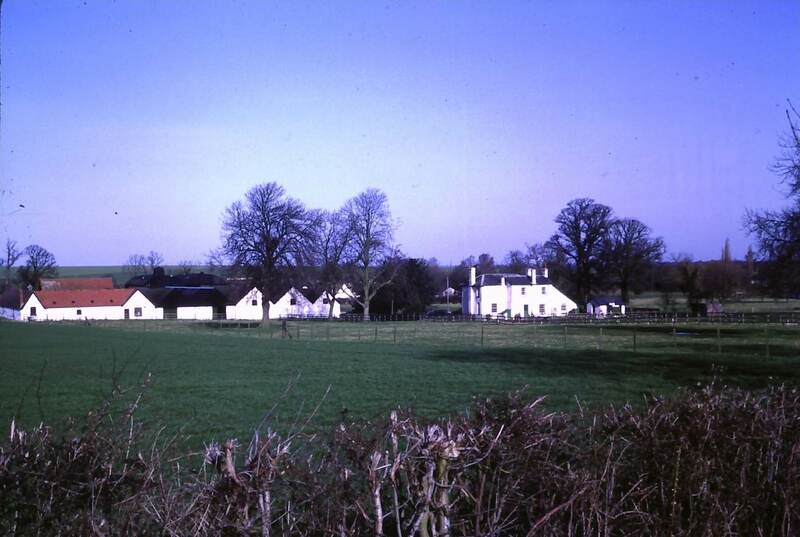 Another view of Avenue Farm in the 1980s from Brockley Road showing more of the buildings. 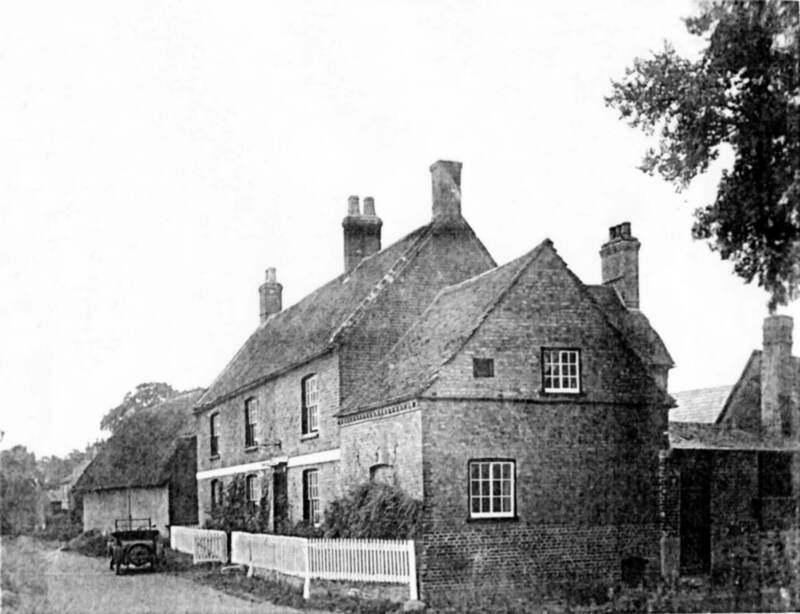 This picture shows the farmhouse from Brockley Road. It is largely unchanged today. 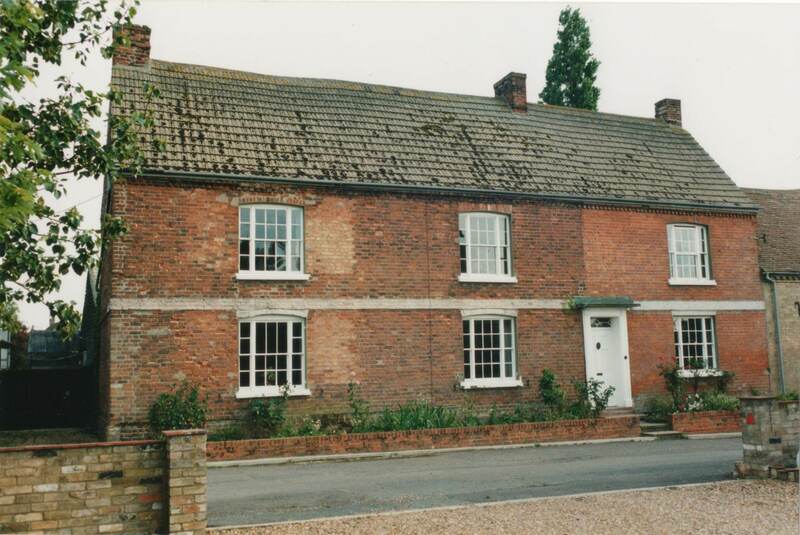 The front of Brockley Farmhouse from Cotterell's Lane in the 1990s. The 1960s development along Cotterell's Lane included detached bungalows at the Brockley Road end, shown in this picture. 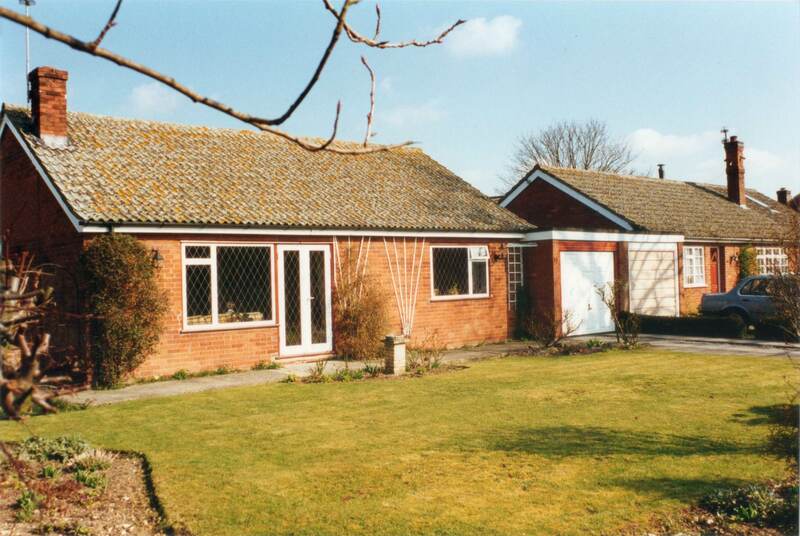 In the 1960s a small paddock between Cotterell's Lane and Smith street was built on with a mixture of chalet style houses pictured above and bungalows. 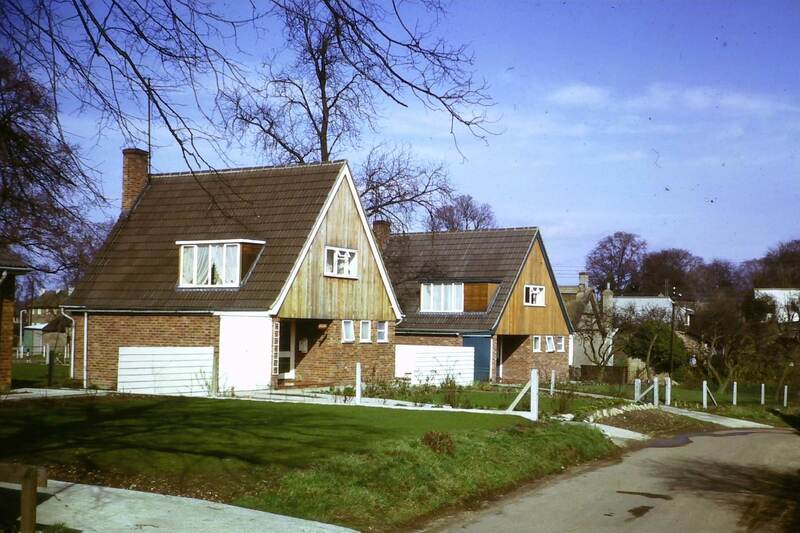 New houses built during the 1960s on the paddock between Cotterell's Lane and Smith Street in the 1960s. 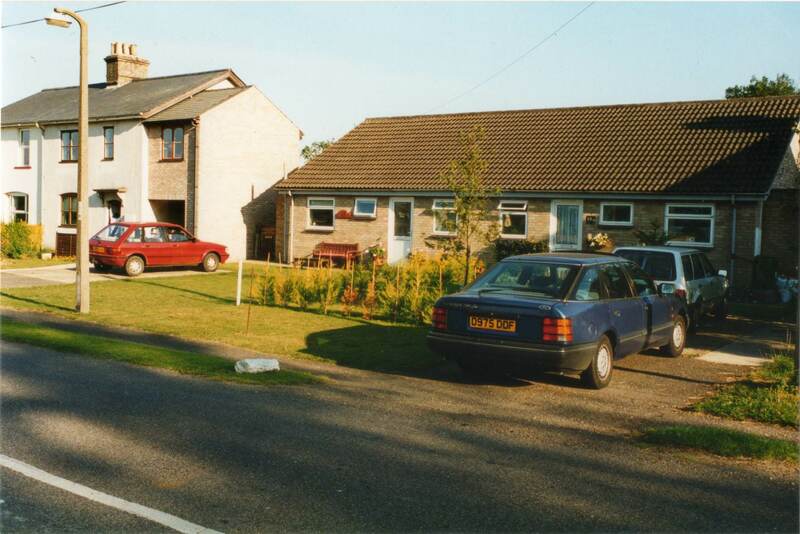 Cottage on the corner of Cotterell's Lane in the 1990s. The outbuilding to the left has since been rebuilt. 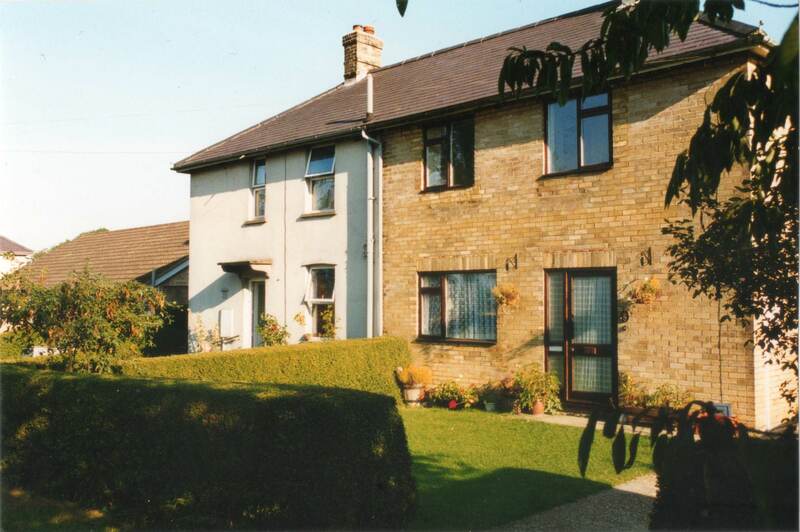 Hill Cottage at the Brockley Road end of Spigot Lane around 1986. 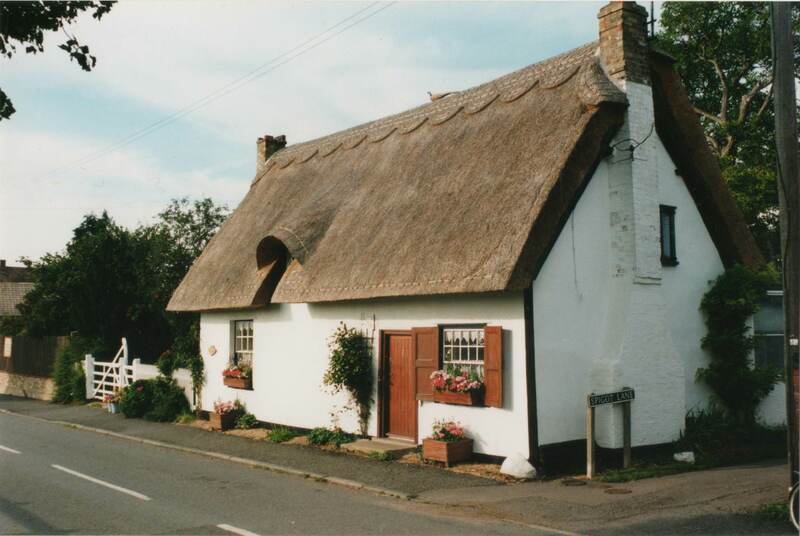 As with many cottages the thatch had been replaced with corrugated iron. 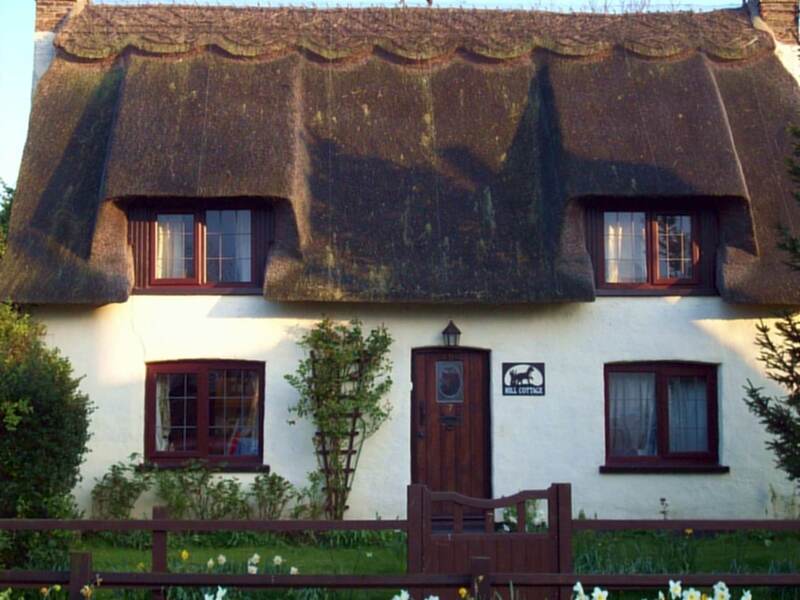 The cottage has since been rethatched and extended. 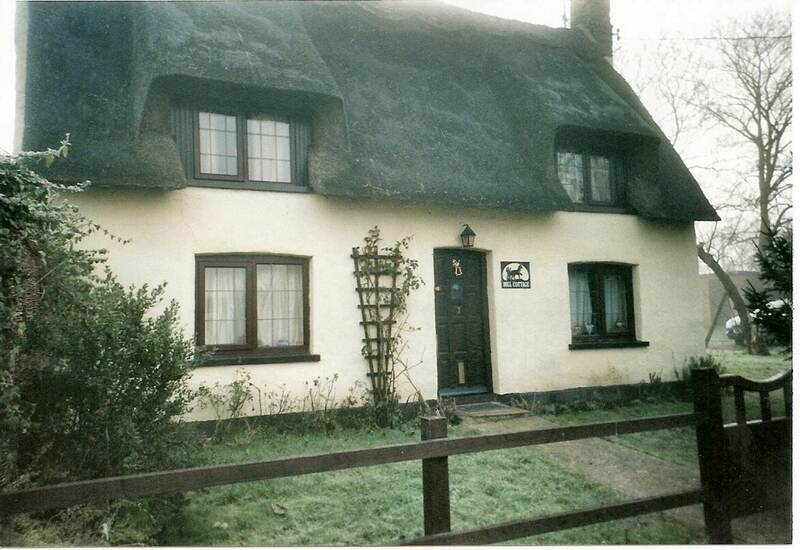 Hill Cottage in Spigot Lane in 2005 after major renovation work including rethatching. 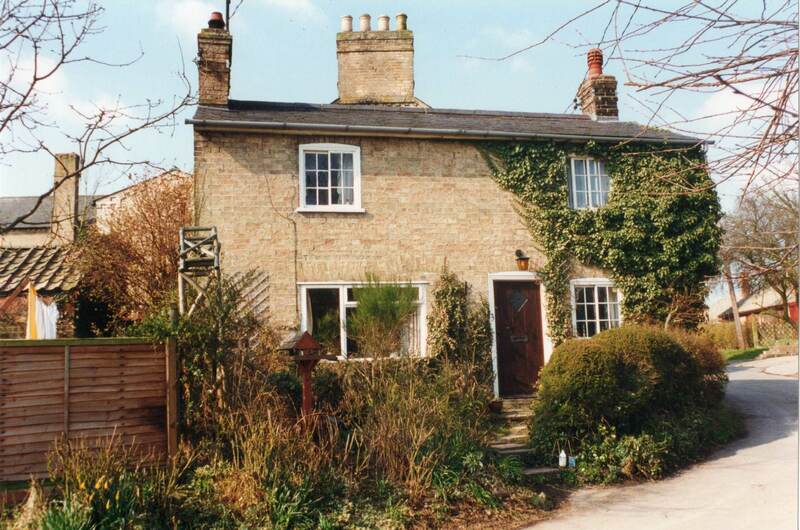 Daisy Cottage in Spigot Lane in 1994, with the extension at the front. The old front door still exists inside the house. Number 8 Spigot Lane when it was being extended in 2005. 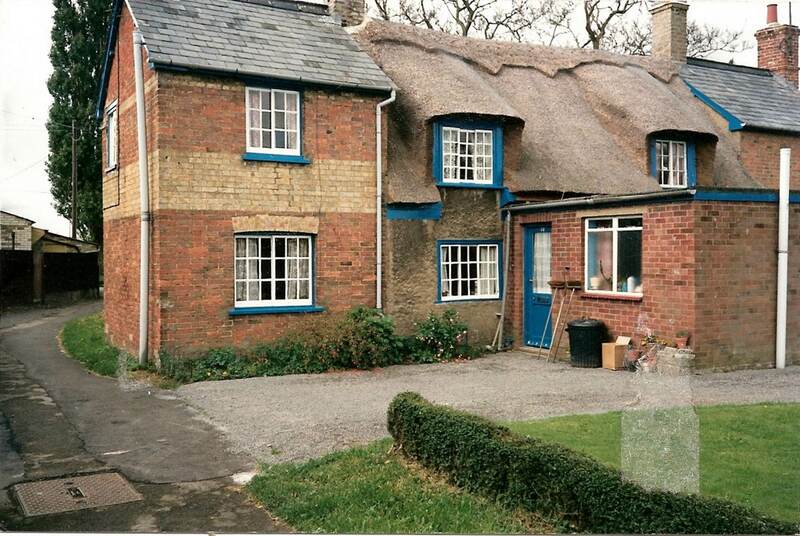 Number 10 (Daisy Cottage) has already has an extension added to the front. 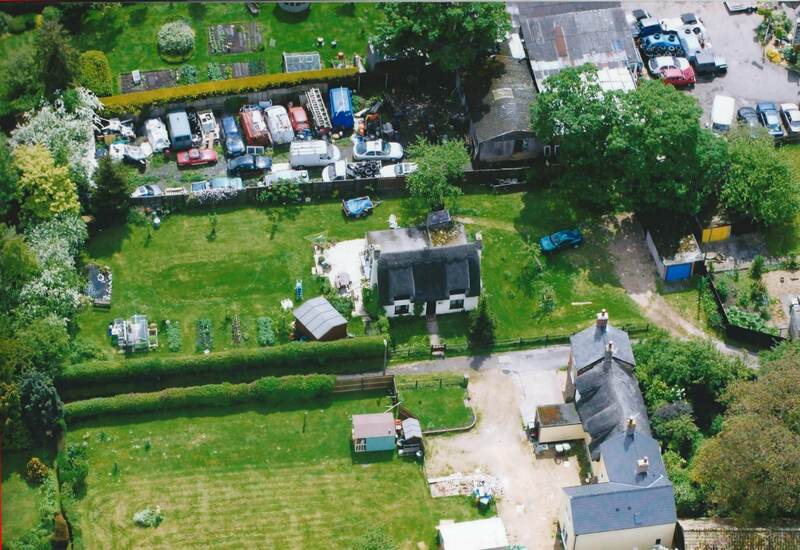 Spigot Lane from a hot air balloon in 2006 showing the cottages and the garage. A pair of council houses in Brockley Road, part of a row of houses built on the outskirts of the village in the 1920s. As late as the 1960s these houses had outside toilets and no electricity upstairs. View looking eastwards along the row of council houses in Brockley Road. 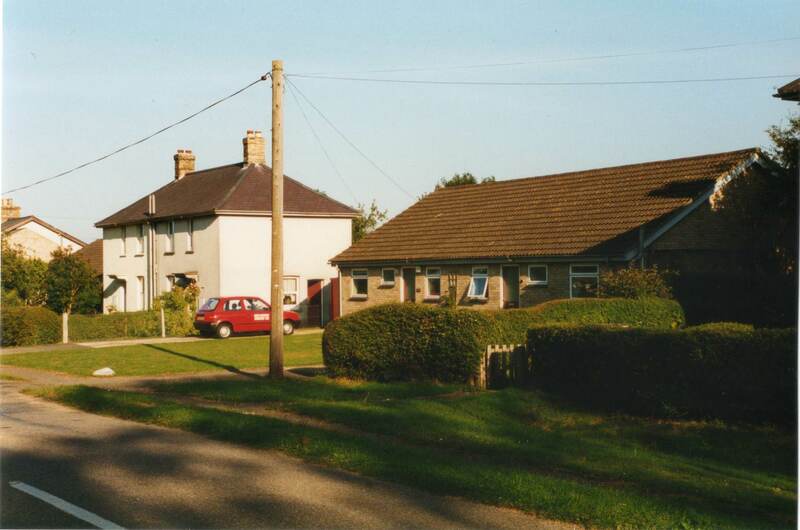 two of the pairs of semi-detatched houses were demolished and rebuilt as bungalows in the 1980s. View of another of the bungalows built to replace two storey council houses. Some of the houses are now privately owned.